Is LANtasy offering a Taco Revolution? Would you believe I went to a broad spectrum gaming type event just for the food trucks parked here? I had this plan in mind ever since LANtasy announced the Duncan-based operation, Taco Revolution, will be coming down to feed the hungry masses. Between this truck and Coast Lunch Box (they have really tasty rosemary garlic fries with truffle oil aioli), I had my motivation in place although I was not all that hungry for the show itself. I’m saving up for Seattle‘s Emerald City Comicon — every dollar counts when I’m thinking about current foreign exchange rates. With help from my friends at VicLUG, I changed my mind the next day because I truly appreciate what this gaming convention is doing for the local geek community. When I’ve been spoiled by the big conventions with a huge variety of exhibits and discussions, to go back to basics is difficult. Even the local events can be spectacular when done right, but when this exhibition did not offer panels this year for folks to learn about the latest rumblings in the industry, well …. This detail will be corrected for future events tho’. When I go to a show, I like to learn and discover. I wrote an article on Otakunoculture.com, where I looked at the show from the perspective of an outsider instead of someone immediately in the know. I too felt affected by the sour impression the staff of Island Fantasy Con left upon the fan community when they took over the reigns and announced the cancellation after Bill Code fell deathly ill. He was no longer in control. I’m not as upset as others are, but with Mr. Code as the face of that operation, he needs to make a statement to clear the air. Whatever the reaction is, I’m sure voices will be heard calling for a revolution. The Traveling Smoke Show is looking to settle down. Before they operated out of Sooke for a few years, but now they’re in the heart of downtown Victoria and that’s where they want to stay. They’re located across the street from Harris Green Village (replacing Landmark Auto Sales) to ply their own take in designer sandwiches and brand of tastes. One look at their menu, and I was hooked at the thought of what does oyster mayo taste like? When it’s all blended up, the succulent taste is something that I can lap up as easily as the ocean waves washing in. It tastes great by itself and I can sea other uses for it, like in a cucumber only sandwich. I’m glad that the Victoria Street Food Festival managed to shake off the cobwebs on the second day of celebration. Even though that happened a week later, from its inaugural July 19th start, the vibe I felt while here at 3pm was far different than the one James and I experienced a week ago. He couldn’t make it this time ’round due to work, but I had to come back for a second day and give this event a chance. The Refiner Diner Food Truck has been much raved about, and why? I’d say it’s because of the fries than their signature crispy cheeseburger. I’m not always in town during lunch-time, and half their product tends to sell out fast during this part of the day. When they first started, I imagine all the people from the Victoria Police Department came here to graze and buy out all of the Refiner’s products. I’m glad this operation tends to post hourly updates on Twitter and Facebook of when certain menu items are out. In a social media generation, I have to say I love their commitment to customer service. Burrard St. & W. Georgia St. I can finally say I’ve tasted the best of what two cities can offer for Japanese fusion hot dogs. 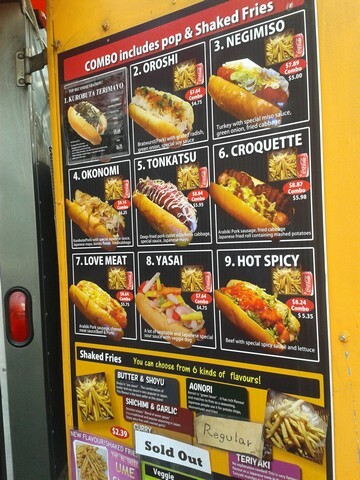 Last year, I was in Seattle and found Gourmet Dog Japon a few blocks away from my hotel. In Vancouver, Japadog has a truck right across the street from where I’m staying. While I missed an opportunity on my first night here for Salvadoran food, I still have two days left … if I can tear myself away from Fan Expo.